Thanks to everyone at the Ulster Aviation Society for their kind donation of stand space for their 2013 Open Day. It was a huge success for both the society and SkyWatch. Our own Paul Trimble was marshalling the helicopters visiting on the day and putting on a fly past which was great to see. 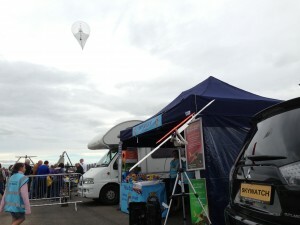 We also took the opportunity to test fly our custom built remote camera system on board the helium balloon. Visitors could see themselves on the ground from around 60ft in the air. When fully deployed the balloon can reach 200ft and with a new camera will give us a detailed zoom and infrared capability, perfect for night searches and a fast view over a wide area, a valuable asset in rural and urban areas. The camera will cost around £6000 so every donation and sale on the stand brings us a step closer to that goal. We were also joined by some new volunteers, including Tom from Switzerland, who is studying Aeronautical Engineering at Queens University. More volunteers also signed up to give us a hand next week at the Portrush Air Show. We have plenty more space for more volunteers if you would like to help out on Saturday or Sunday so please get in touch if you have an hour or two to spare.